Hybrids - Are They Green or Brown? One of the perks of my job is that I travel to exotic destinations. A few years back I ended up in Edmonton Alberta in the dead of winter with temperatures hovering around -25C. At the car rental counter I was given the choice between something and a Toyota Camry Hybrid. I jumped at the chance to drive one of these new technology cars. I'd always been intrigued with the hybrid concept but was not ready to scoot around in a Honda Insight, something that looked like a sci-fi project. Once I figured out the 'starting' procedure and got the controls set, which included a driver info centre with wheels, battery, motor and lots of flashy arrows, I was off. I quietly whirred my way out of the parkade and by the time I hit the road, the heater had the car nice and toasty. The motor finally fired up at about 50kph (30mph) and highway speed was not far away. There have certainly been some interesting cars made around the world in the last hundred years or so. 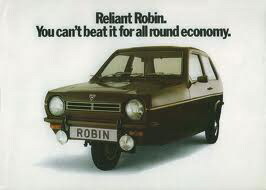 Some, like the three wheeled Reliants and Bonds made in England skirted tax laws. Three wheels were taxed as motorcycles and four as a motorcar. Others, like the German Messerschmitt must have been made solely to use up spare aircraft parts. Japanese tax laws used an engine size of 360cc as a cut point resulting in some tiny 4 wheeled shoe boxes that were at least stable in corners. The handle in the back is to turn it around! Then there were some cars that were just plain ugly. Like the Pontiac Aztec. 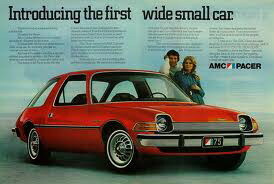 Or the AMC Pacer. So my question is: In your opinion, what is the ugliest car you can think of?